Neal Rantoul is a career artist and teacher. He has taught photography since 1971. He is an emeritus professor and was head of the Photography Program at Northeastern University for thirty years and taught for thirteen years at Harvard University as well. Rantoul has work in numerous public and private collections and is the recipient of many awards and grants. Rantoul was an active member of the Board of Directors of the Photographic Resource Center in Boston for many years and is on the Board of Corporators at the Griffin Museum of Photography. Since retiring Rantoul has been teaching workshops, traveling and making new work. The entry fee for the exhibit is $35 for the first two works. Artists may submit one or two additional works for $10 each for a maximum of four works. You will be able to pay the fee with a credit card after uploading your images. The notification announcing the juror’s selections will be sent by email and posted on our web site on or about June 1. 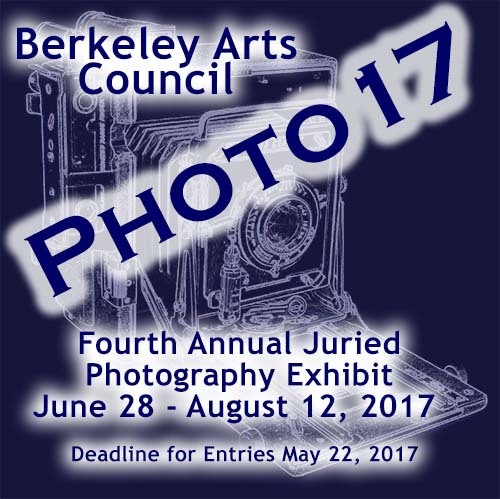 Entries for Photo17 exhibit must be submitted as digital images for jurying. You may submit up to four images to be juried for this exhibit. If accepted, the original works must be framed and equipped with wire, ready for hanging. Frames not exceed 36 in width. No substitution, exchange, modification, or withdrawal of works is permitted after they are accepted for the exhibition. The Berkeley Arts Council will retain a 30% commission on all sales. Works may not be removed during the exhibition. All work must arrive between June 19 and and June 25, 2017. Shipped works must arrive between June 19 and June 23. For hand delivered work, The Berkeley Art Works hours are Wed (June 21)Thu (June 22) 11-5, Fri (June 23) 11-5, Sat (June 24) 10-4. We are normally closed on Sunday but will open the gallery for the delivery of work on Sun, June 25 from 12-3. Shipping: The Berkeley Art Works does not receive US Mail at the gallery address. Do not ship to the gallery address by US Postal Service. Please use UPS or FEDEX. If you are unable to use UPS or FEDEX to ship your work, please email us for instructions. Shipped works must arrive between June 19 and June 23, 2017 for inclusion in the exhibit. Work must be shipped prepaid to The Berkeley Art Works in sturdy, reusable packing. (Please no styrofoam peanuts!) Plexiglass must be used on all shipped works, no glass. For return shipping a prepaid shipping label must be included. Please email us with tracking information at berkeleyartswv@gmail.com. Additional details will be provided to accepted artists.